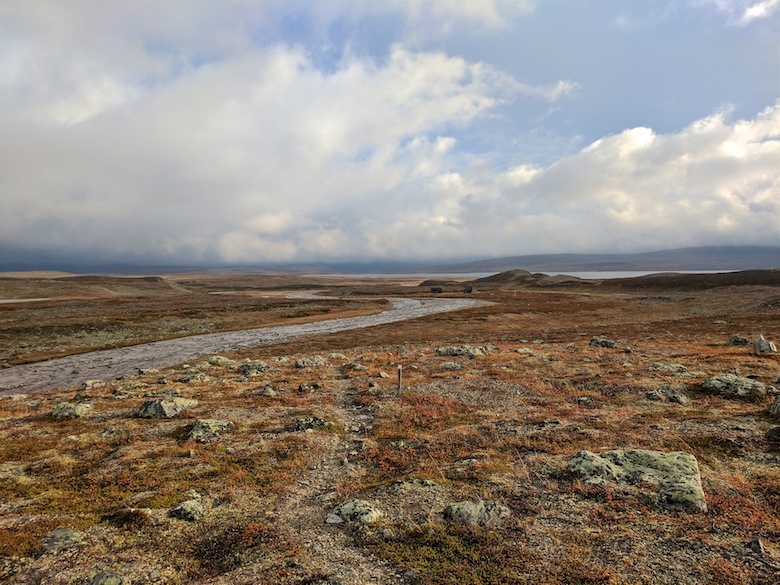 The Arctic trail starts at Kautokeino in the far north of Norway and heads south for approximately 800 kilometres. 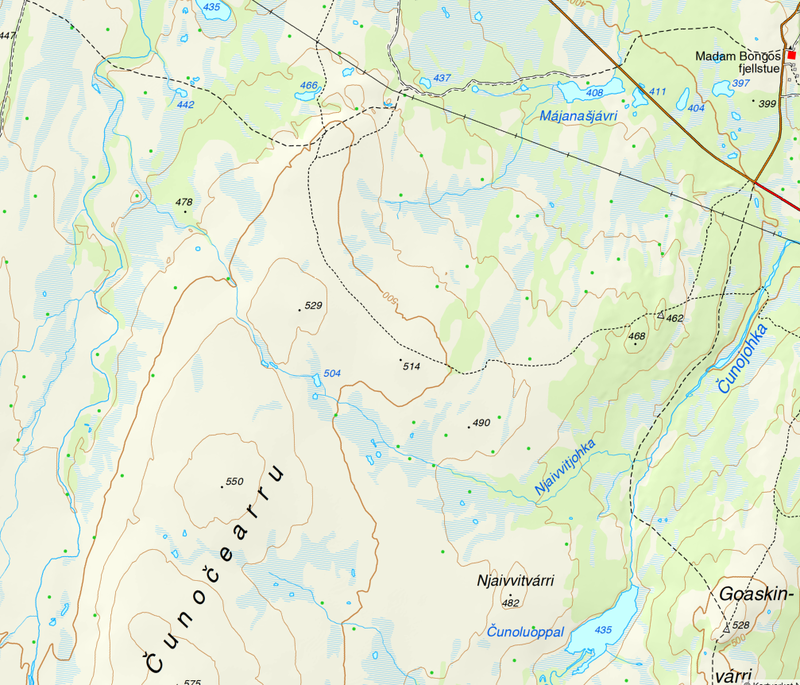 It crosses into Finland and Sweden, finishing either in Kvikkjokk (Sweden) or Sulitjelma (Norway). To confuse things the trail has a different name in each of the countries through which it passes. 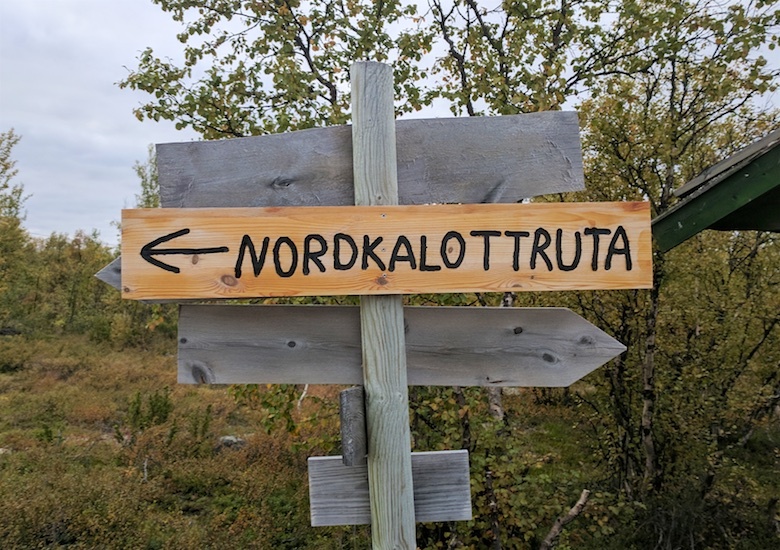 In Norway it is called the Nordkalottruta, in Finland the Kalottireitti, and in Sweden the Nordkalottleden. 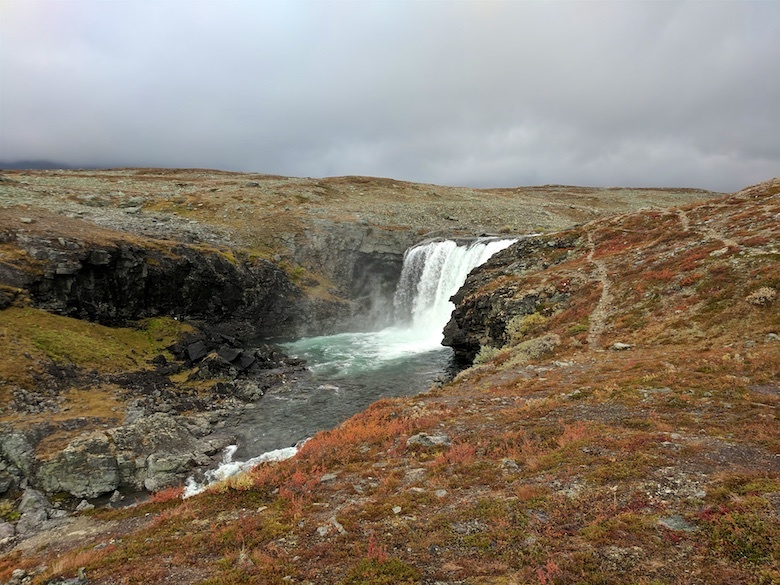 In English it is simply called the Arctic Trail as the entire 800 kilometres are above of the Arctic Circle. 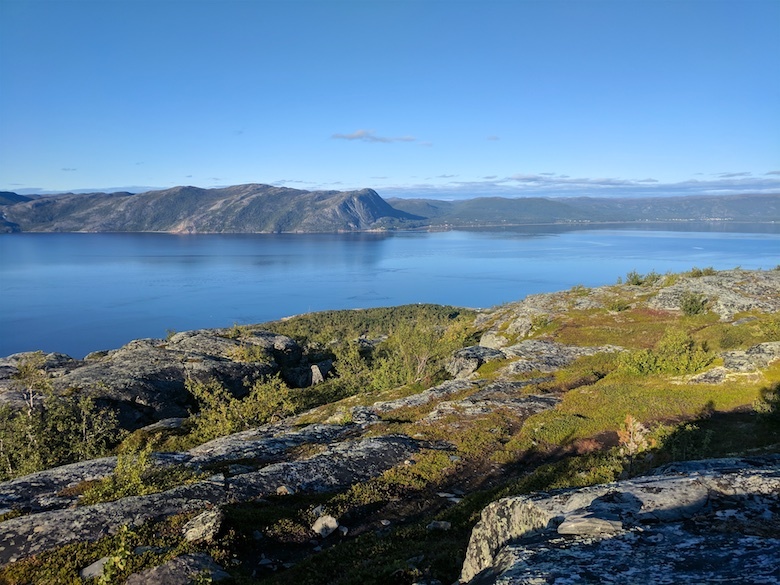 Not to be confused with the Arctic Circle Trail, which is in Greenland! Part one can be read here. Part two can be read here. Part three can be read here. It was a blessed relief at dawn to escape the claustrophobic confines of the hut. It had been a painful and uncomfortable night, the room hot and stuffy. The rain of the previous day had blown through and it was good to watch the hut recede into the distance. 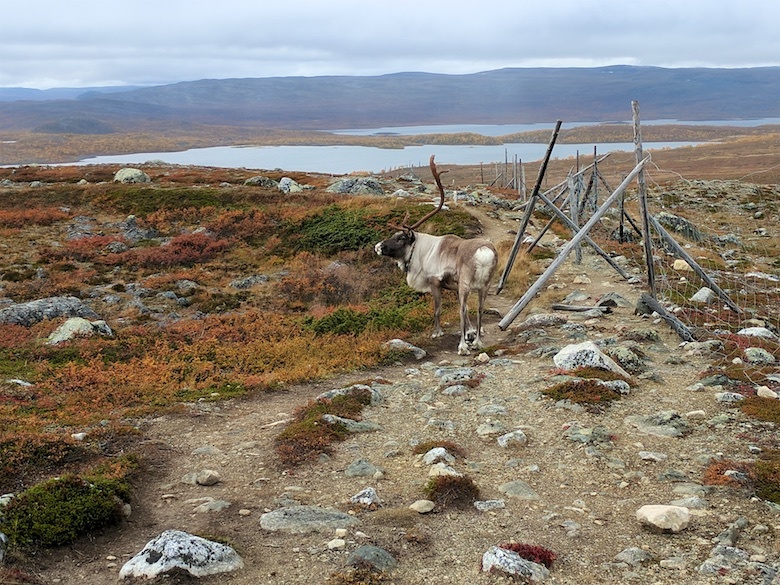 The Norwegian / Finnish border was a relaxed affair, a large cairn painted yellow and adorned with a reindeer antler. I had no goods to declare so was able to cross unhindered. 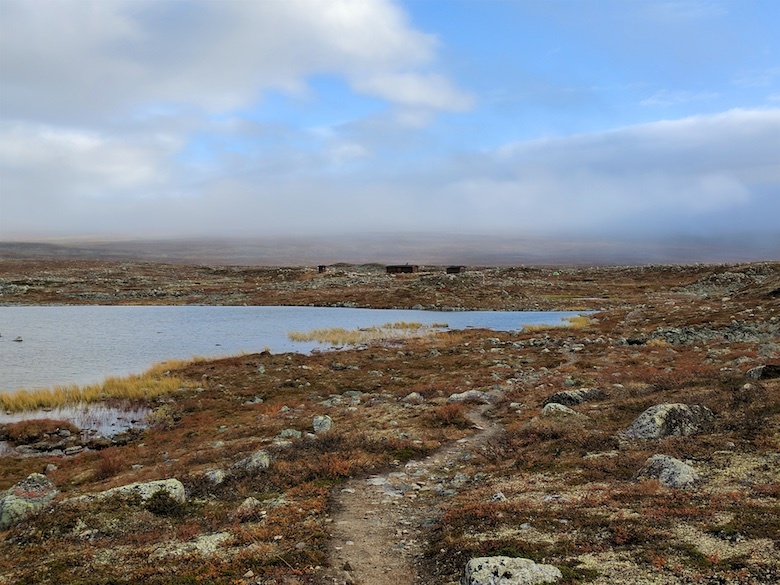 A couple of kilometres past the border and the trail passes the wilderness hut at Kopmajoki. 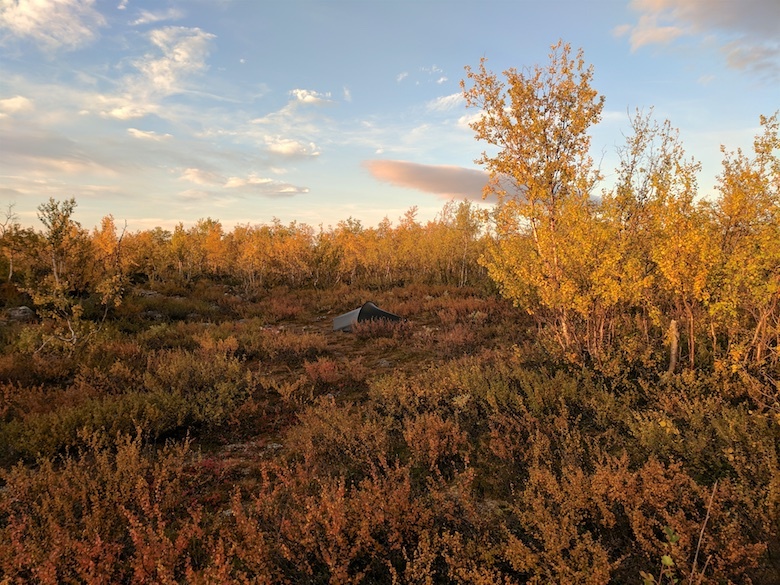 In Finland they have a network of wilderness huts which are free to use, more information can be found here. The hut was extremely homely and I immediately started wishing that I had stayed there the previous night. It had bunks for six people, a gas stove and utensils for cooking, plus a wood burning stove. Outside was a wood store that was filled to the brim with chopped birch wood, and an enclosed privy nearby. The log book indicated that no one had stayed the previous night. The hut itself was absolutely spotless with not a scrap of litter or even any dust on the floor. I was soon joined by Thomas with whom I had shared the hut the previous night. As the trail that day would go over a 930 metres pass we decided that we would team up to cross it. 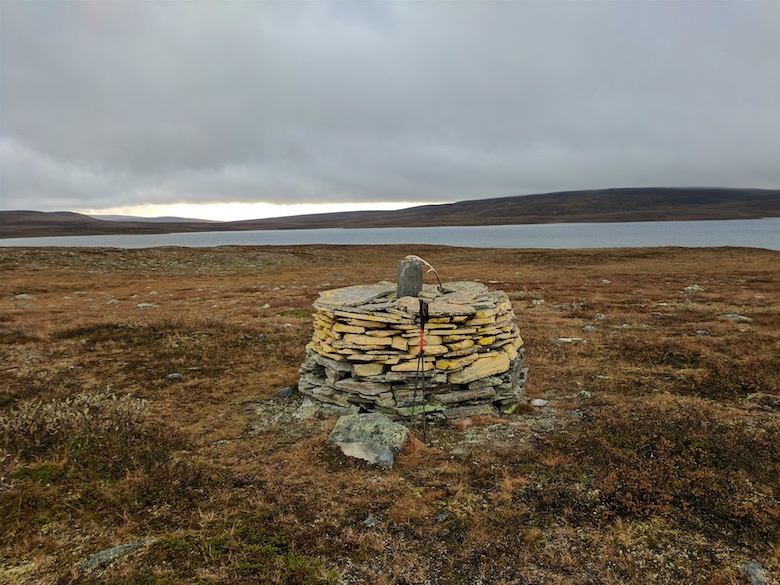 The main difference between hiking the Arctic Trail in Norway and Finland are the trail markers. In Norway I was always on the lookout for a painted red T either on rocks or a cairn. 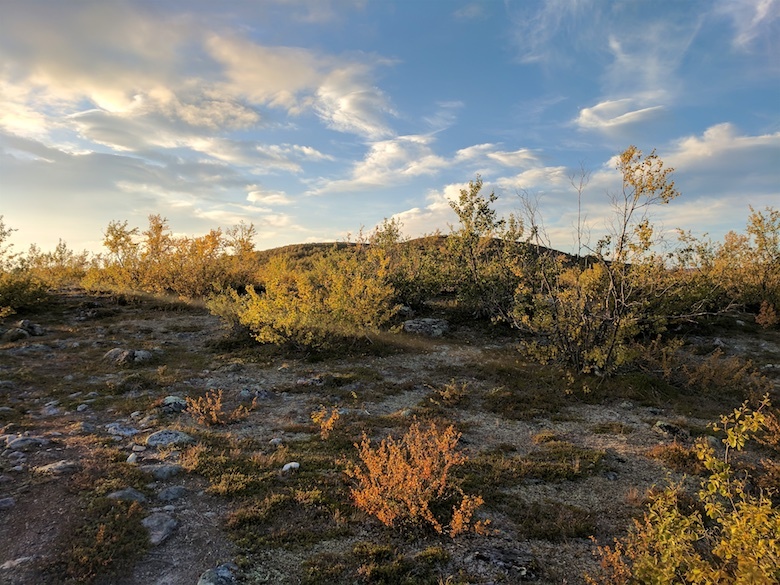 In Finland the trail is marked by a short wooden post about thirty centimetres high with a yellow top. I found the Finnish version less visually obtrusive, which really translates as harder to spot! As we started the long climb up the pass our conversation turned to pack weight, as Thomas was clearly struggling with his. 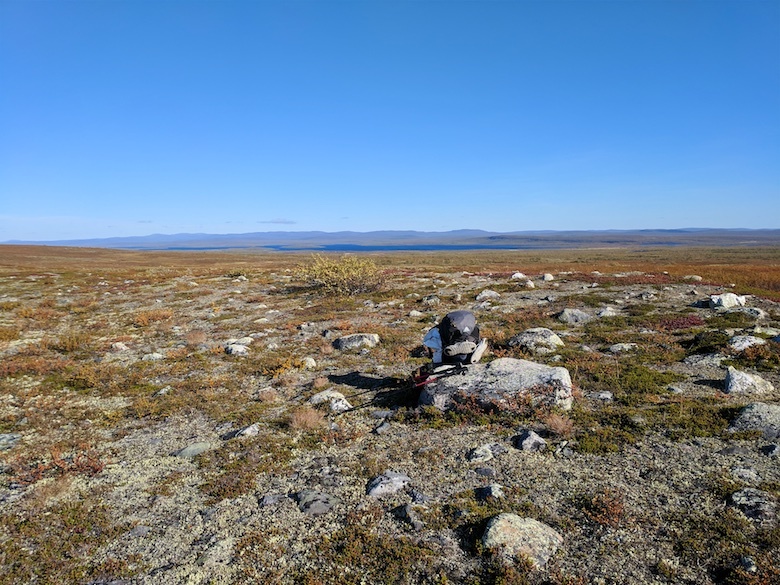 It turned out that he had started his trek with it weighing about 40kg, a weight that I would struggle to lift let alone carry across rough terrain. Much of that weight appeared to be camera gear, including several lenses. My pack at the start had been around 20kg, probably at my limit these days and relatively light considering I had supplies for twelve days. The trail crossed the wide Goapmajohka and I did a really stupid thing. I focused on keeping my feet dry instead of just wading across. Whilst boulder hopping I lost my footing and fell forwards, straight into the river. Thankfully I went down onto my knees so I remained dry above the waist, however I was soaked from my undies downwards. Thomas was ahead so I avoided the humiliation of my lack of grace being witnessed. I removed my waterproof trousers in the hope that I would slowly drip-dry, even though there was a fine drizzle. The path was soon lost in a tangle of boulders and the mist came down as we approached the top of the pass. One of us would stand still whilst the other looked for the next marker, this was repeated for what felt like hours. If we weren’t crossing slippery boulders we were standing ankle-deep in water. 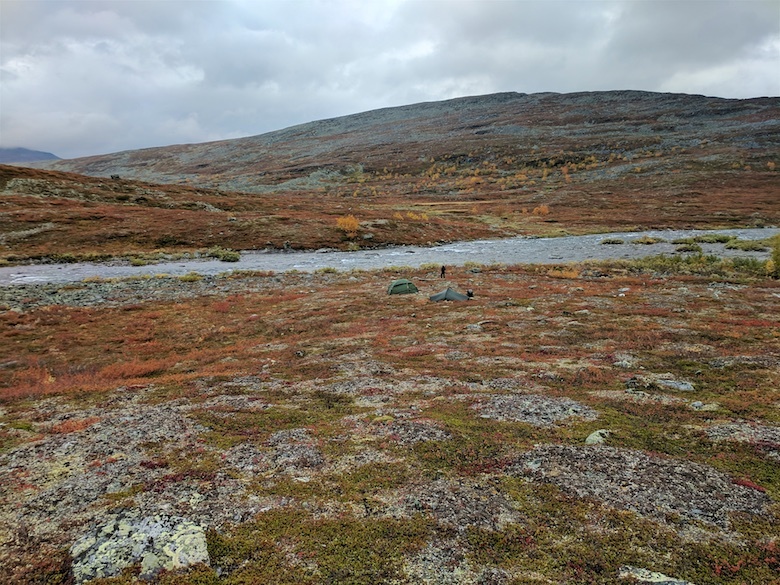 It was a relief to cross the highest point and squelch down to the next wilderness hut located next to the large lake called Pihtsusjarvi. The verandah was full of huge rucksacks but there was no one in the hut itself. I peeled off my sopping wet boots and socks and set about making a hot drink and cooked noodles for lunch. It was good to air my feet, even though I knew I would have to put the same soaking items back on again. As we were about to set off, the owners of some of the rucksacks appeared. 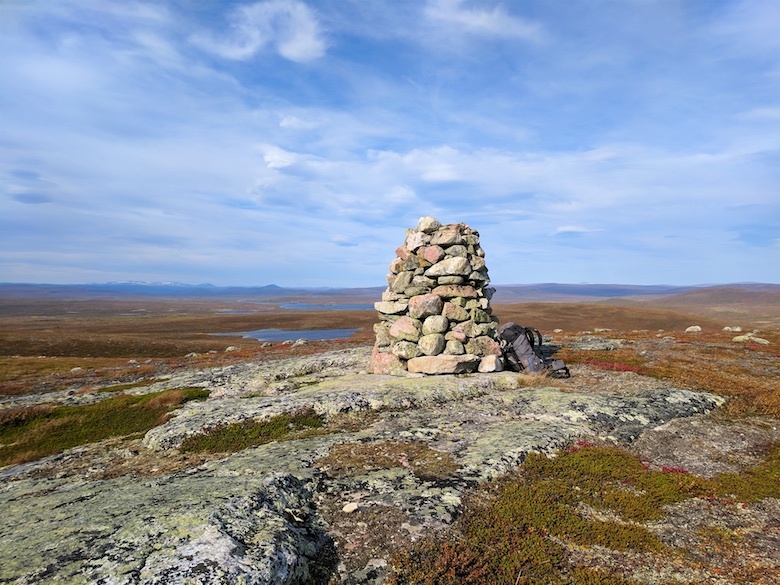 They had been up to the summit of Halti, the highest point in Finland, a goal for many Finnish people. 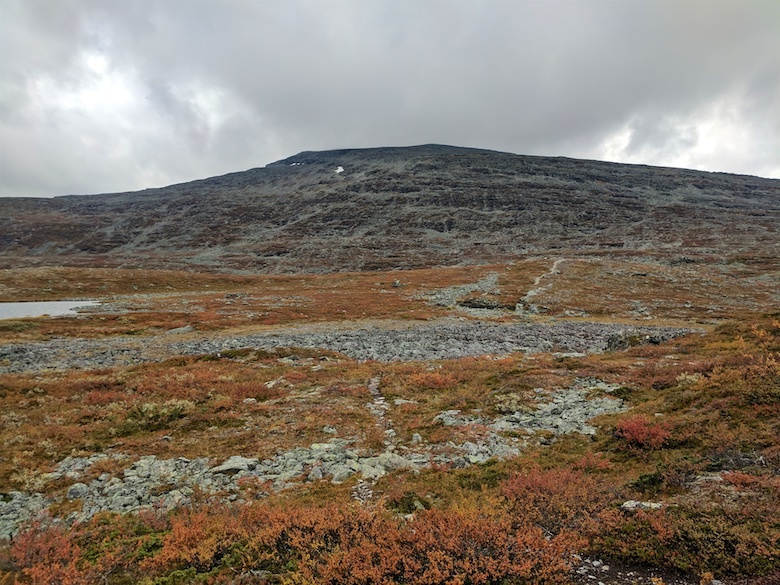 The highest point in Finland is at 1,324 metres whilst the actual summit is a kilometre to the north in Norway at 1,365 metres. There had been talk a couple of years ago about Norway gifting the summit to Finland, however it never came to pass. 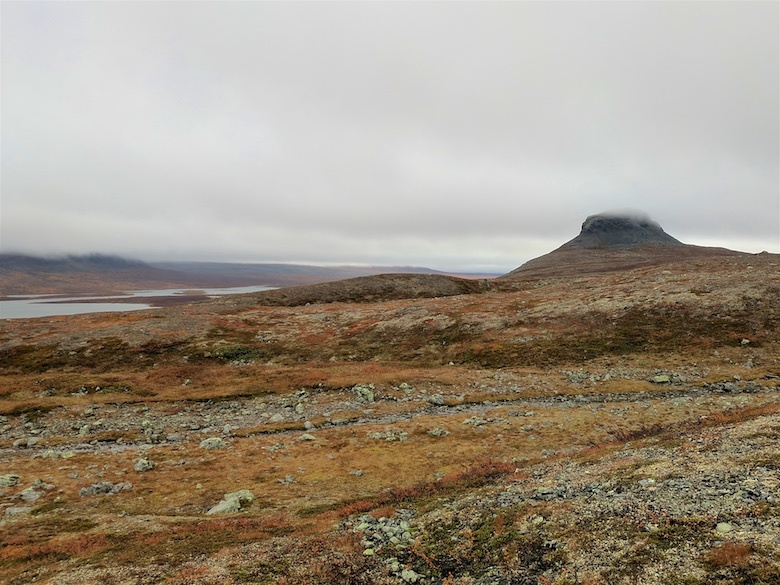 Due to the popularity of the hike the previously empty trail soon became much busier on the way to Kilpisjärvi. 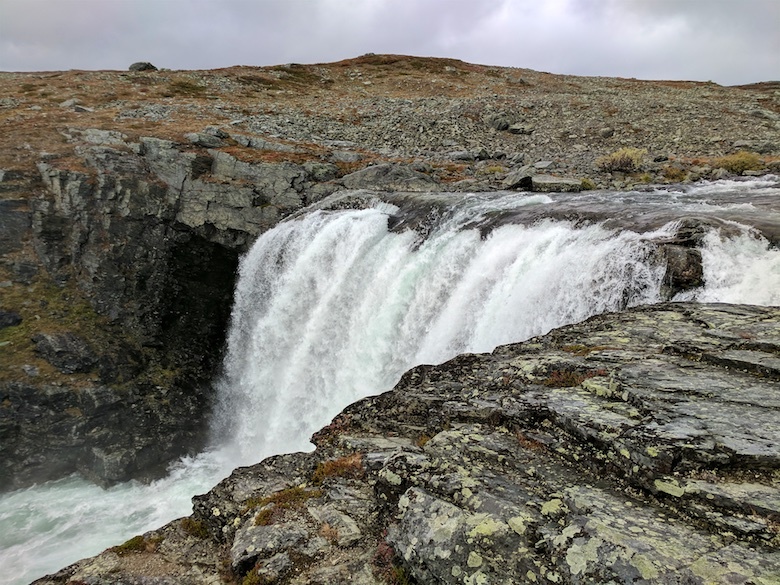 A river flows wide and strong from the lake, becoming an impressive waterfall at Pihtsusköngäs. The power and noise was incredible and we stood mesmerised at the top for a while, becoming soaked by the spray. It’s worth taking a small detour from the main path to get a proper look. The cloud was slowly lifting again, giving us a good view of the surrounding mountains. 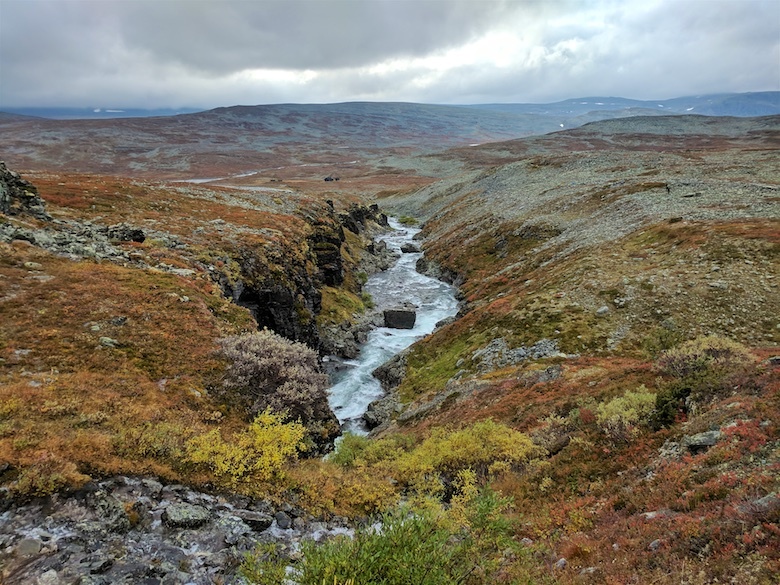 This part of Finland is surprisingly rugged. With much more foot traffic on the trail it became easier to follow, although still exceptionally rough and bouldery. The cumulative effect on my boots was that they looked like the top layer of leather had been sandpapered away. As the afternoon wore on finding a decent pitch began to look increasingly unlikely. The ground was either solid rock or prickly tent killing vegetation. 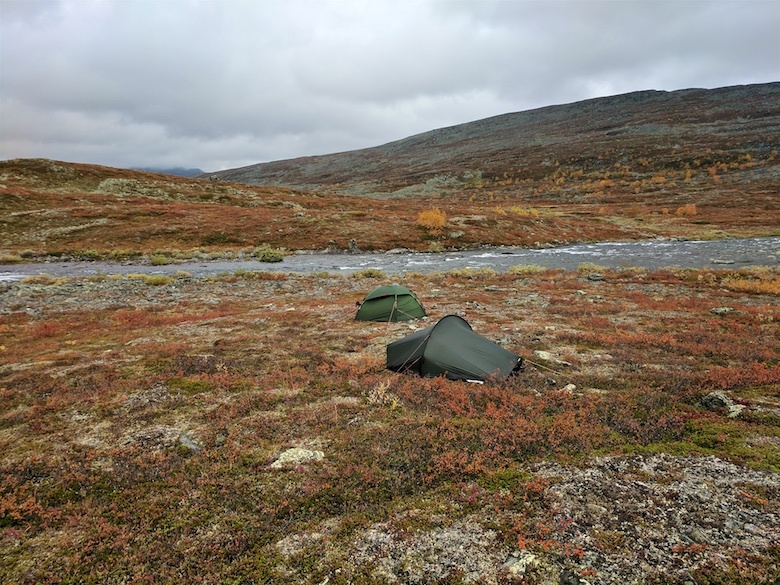 In the end we found a spot above the river and got the tents up whilst it was still dry. I wandered around for a while waiting for it to air as it was still soaked from being flooded out a couple of days before. It really was a cracking location, especially with the autumn colours which had burst into life. It rained all night, leaving a residue of low cloud and drizzle the following morning. There was a softness to the light that somehow accentuated the colours of the vegetation and the lichen on the rocks. Everything was slick under foot and we had to shuffle across areas of board walks over marshy areas and impenetrable boulder fields. The verandah of the locked wilderness hut at Meekonjarvi provided some shelter from the weather whilst we snacked. We could not be bothered with the half mile detour to the open hut. 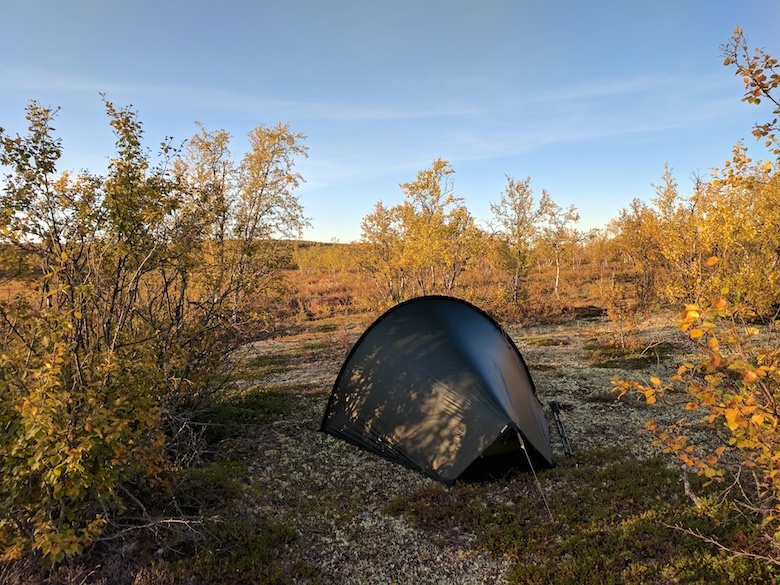 Often the Finnish wilderness huts have an open section and a locked reservable section. In busy areas if you want to be sure of a bed you can reserve in advance for a small fee and pick up the key. Apart from that the facilities look to be the same. Once again we climbed towards another high pass, this time through a wide valley. To start with there were excellent views but we soon found ourselves swallowed by the mist. 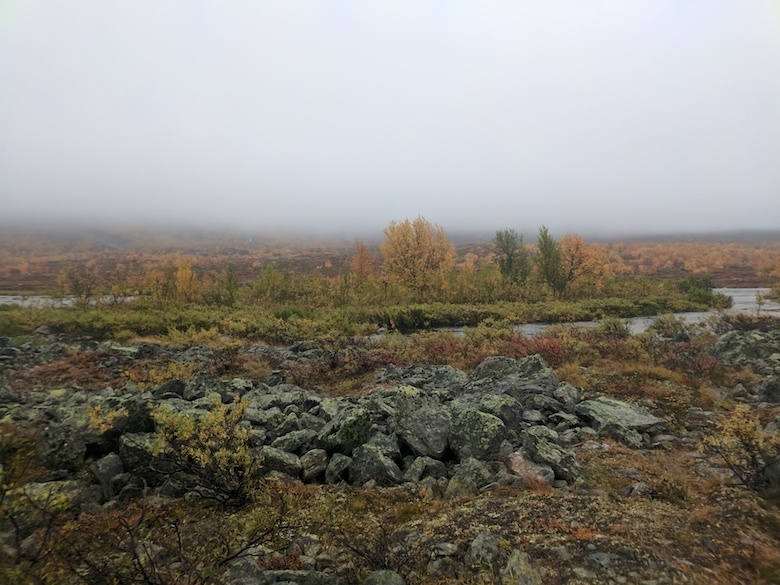 The wilderness hut at Kuonjarjoki loomed out of the clouds just in time for lunch. A pleasant half hour was spent there in the company of some young Finnish men, who patiently answered all my questions about their country. How they managed to remain so clean and well presented after a few days in the mountains amazed me. I was filthy by this stage and was very aware of my unwashed clothes and body in the warmth of the hut. Thomas decided that he had had enough for the day and wanted to stay in the hut. I was keen to press on so that I could reach the luxury of my booked accommodation as early as possible the following afternoon. Sadly there were no views from the 950 metre high pass, just more boulders looming out of the mist. It was whilst descending that my mobile suddenly pinged into life, informing me that I had unknowingly been involved in a spot of drama the previous couple of days. Apparently the two messages I had sent from the hut after injuring my arm had not gone through. My wife, and friends Chrissie and Geoff had been tracking me on Social Hiking via my Spot3 device. 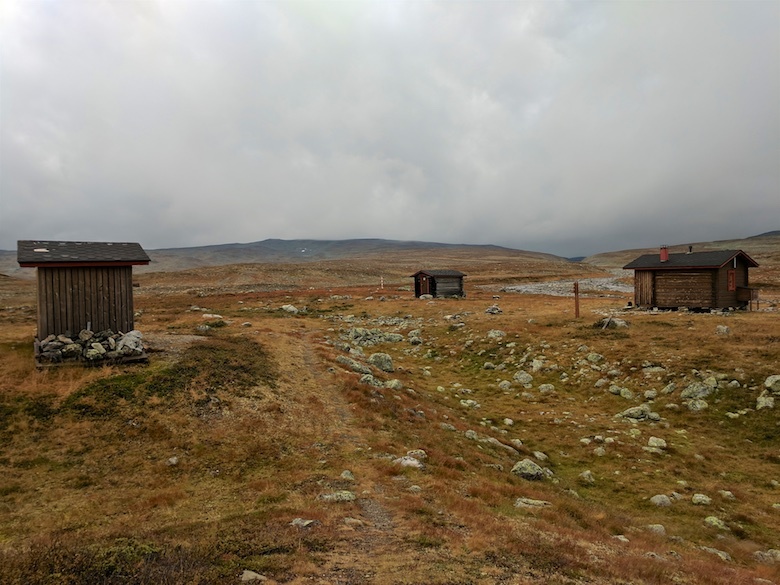 When I had reached that hut in Norway at 10.30am I sent two messages and then did not move until early the next day. Because those messages were never received all they knew was that I had stopped moving for some unknown reason. By early evening they started to properly worry and decided to call the Police. Interpol and the Norwegian Police were informed after my wife had lots of fun and games being passed on the phone between various people who were unsure what to do. She informed the Police the following day that I had started moving again, but it appears that no action had been taken anyway! The moral of the story is that you really should not rely on tracker devices to keep you safe. They are simply an additional tool. Funnily enough the time when I was being reported as missing was when I was in pure agony with my arm. I really would have welcomed a rescue at that point! I pitched that night just off the trail on the shores of a high lake. The temperature really dropped and there was a damp chill in the air. Mist covered the surrounding hills, sometimes drifting just a few metres above the water. It was an atmospheric place to spend the last night on the trail. 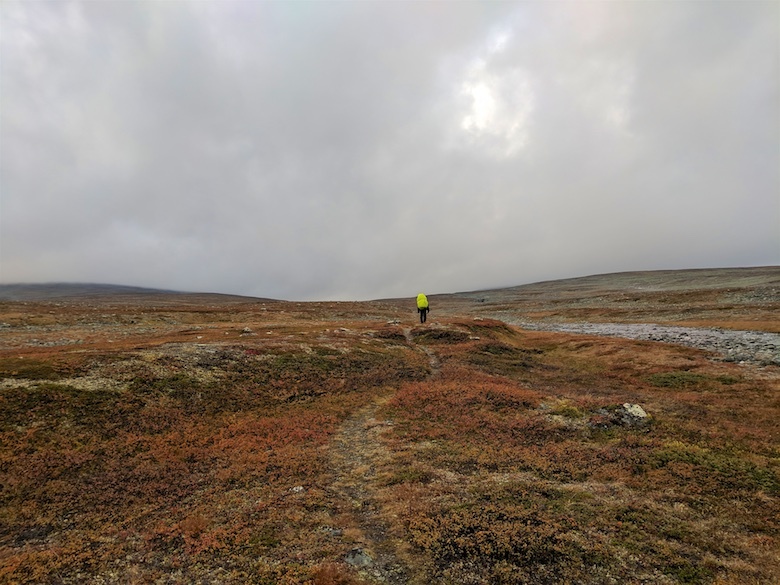 A few people passed me during the evening heading for the wilderness hut at Saarijärvi. The trail the following day continued to be tricky underfoot, constant boulders meant that it was hard to really stride out. 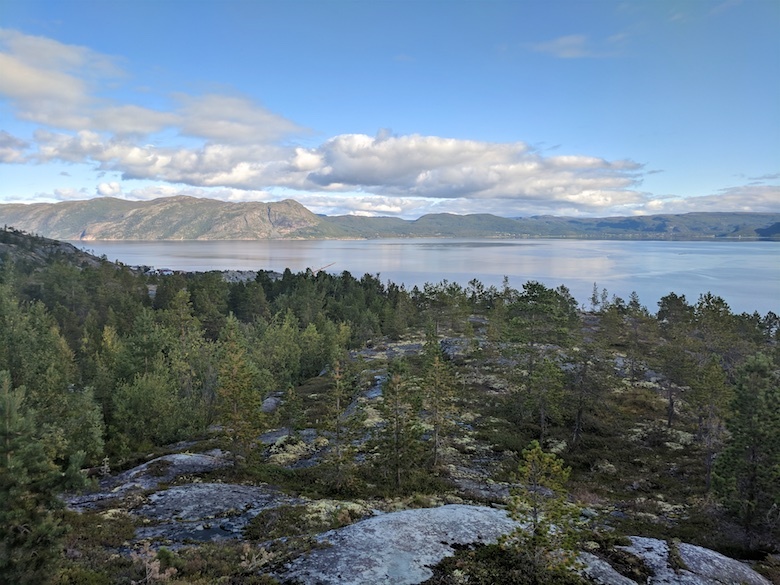 As I once again crossed the border into Norway and then back into Finland I could almost smell civilisation. I passed a few day hikers, the first I had seen on the entire trip, their scent of soap and detergent strong after so many days in the wilds. 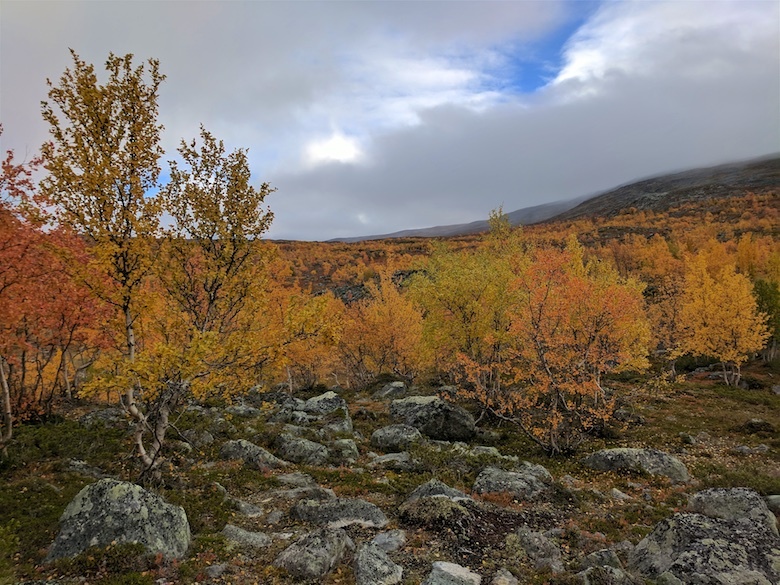 As the trail descended I was once again in the birch forests which were ablaze with colour. 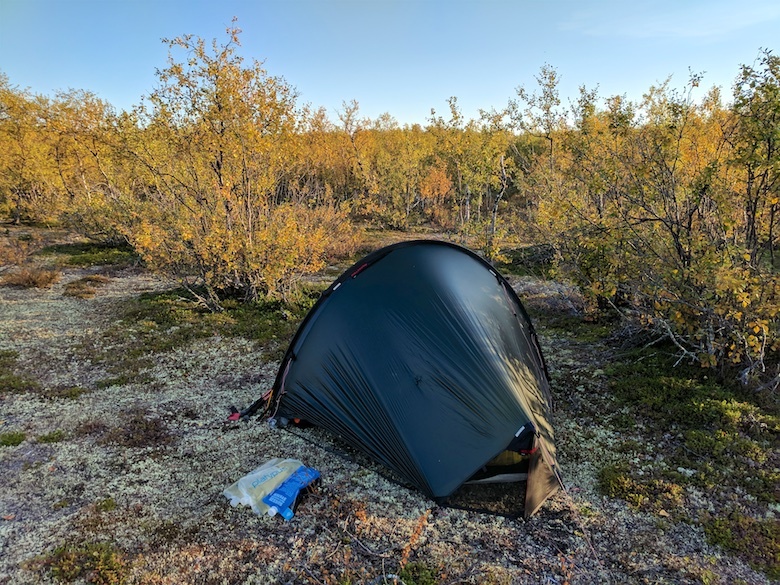 Part of me really wanted to spend time and savour the last few kilometres, whilst the other part was keen for a shower, fresh food and a comfy bed. 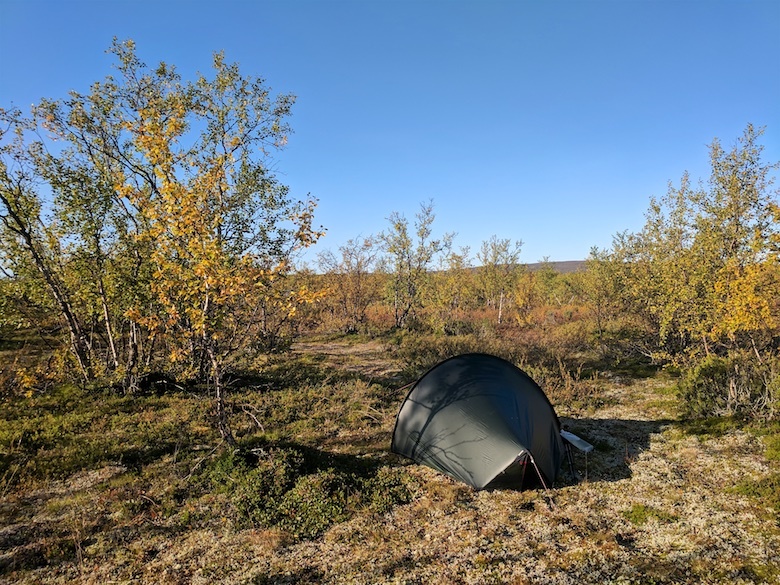 I had splashed out in advance and booked an apartment in kilpisjärvi for a couple of nights. I apologised for my smell when I entered the homely reception area. The owner said that it was normal for people in the area to smell like ‘nature’. I was soon sat on the balcony with a pizza and cold beer, both pleased and relieved to have completed one of my toughest treks yet. 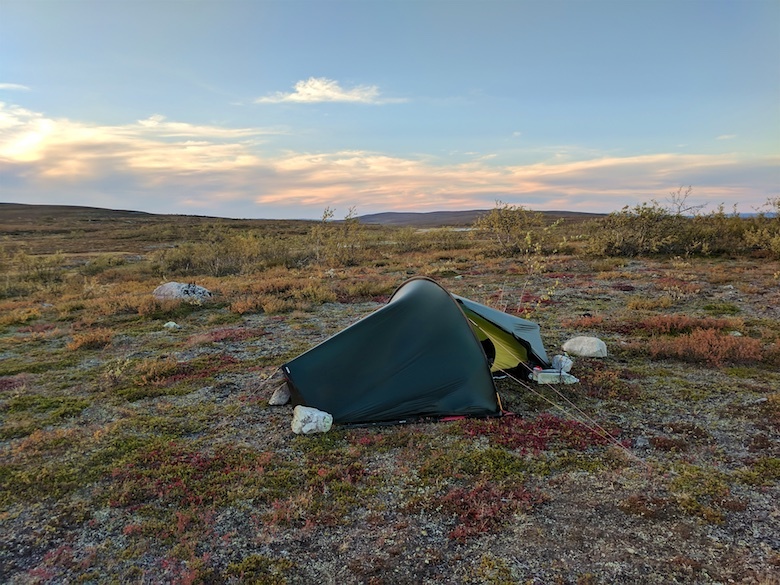 In a couple of years I plan to return and continue on down the Arctic Trail. 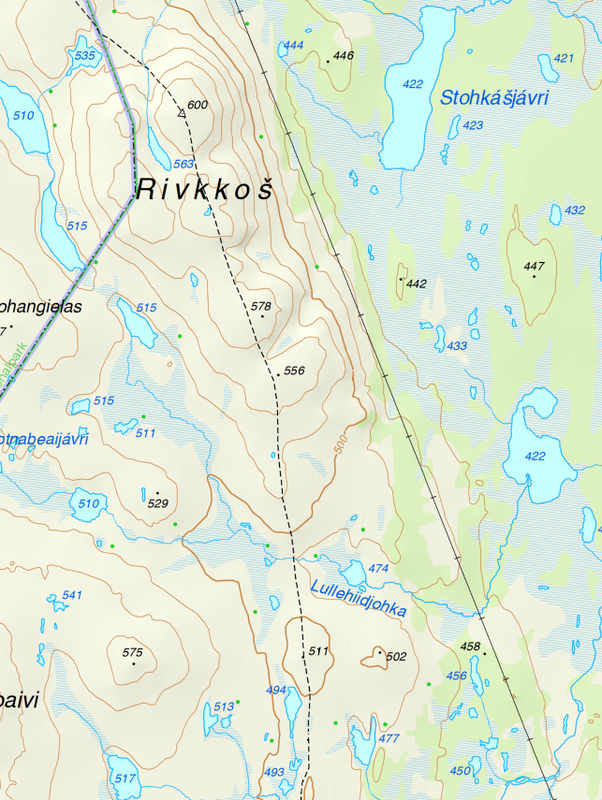 The paper map that I used on this segment is the 1:50,000 Halti / Kilpisjärvi by Karttakeskus. It’s an excellent map and nearly as good as Ordnance Survey in detail. 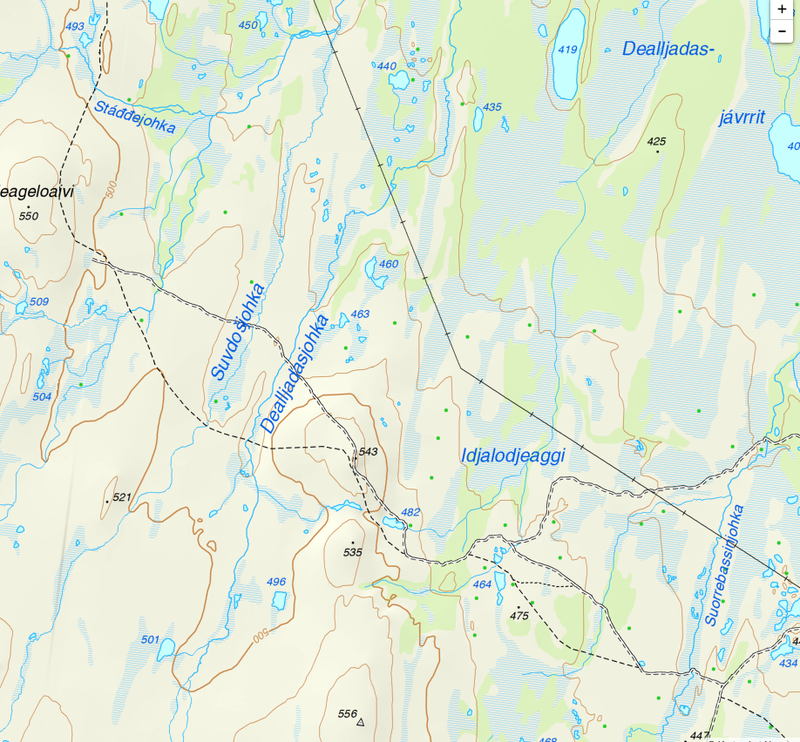 A step up from the Norwegian maps used on previous segments. 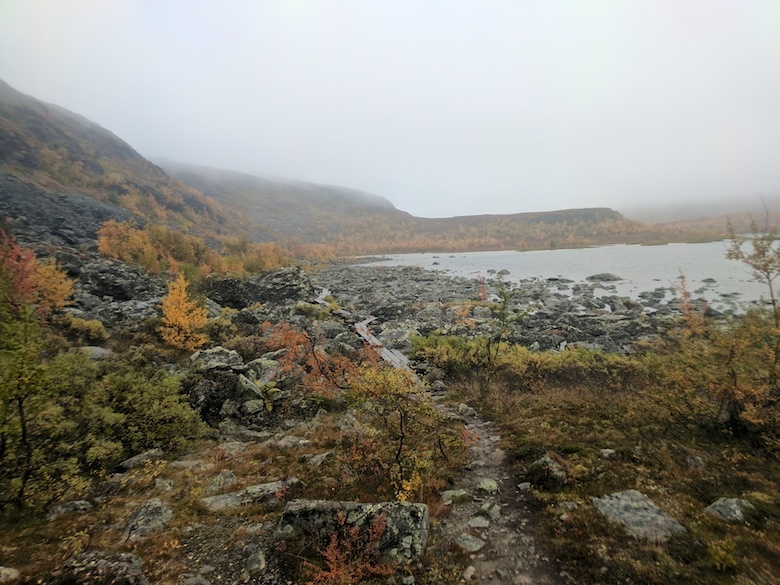 Whilst hiking I shared my route live on Social Hiking. That route can be found here and viewable on Google maps. When researching this trail I found that there was little written in English. Hopefully this blog will be helpful for others planning a similar trip. 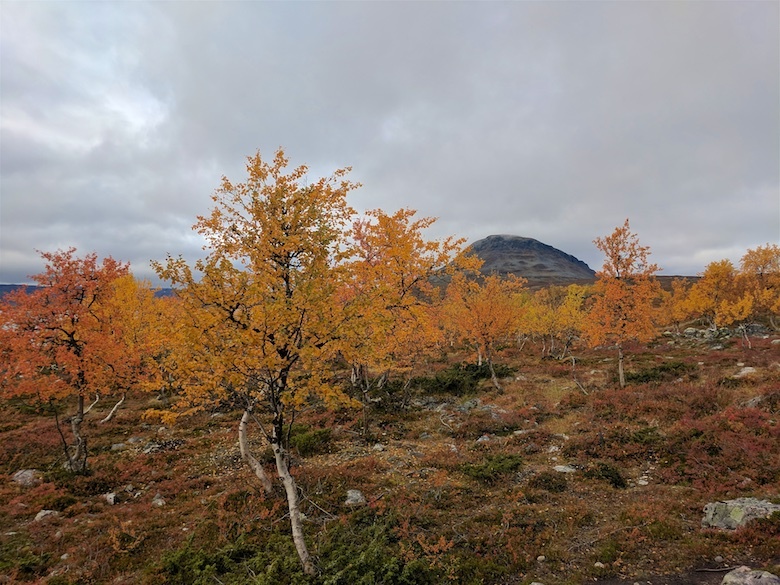 The plane was half empty when it landed in Alta at 11.00pm on a Friday night, most passengers had disembarked during the brief stopover in Tromsø. 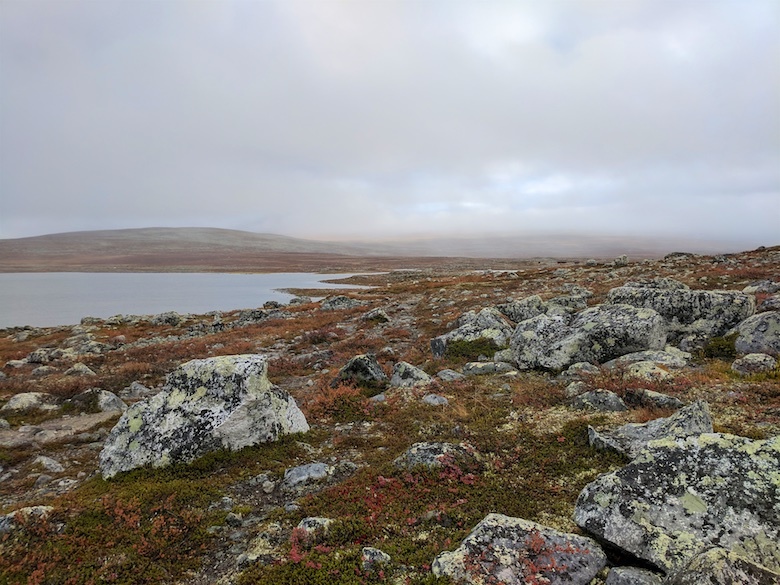 Alta is the second most northerly city in the world with more than 10,000 inhabitants. Waiting for my luggage in the tiny airport I watched the passengers wrap up warm and disappear into the dark and rainy night. The last bus into town had long gone so I walked over to the empty taxi rank, wondering what to do. Thankfully a taxi pulled up within a few minutes. I passed the handwritten address to the driver for the Airbnb that I had booked, then marvelled at the speed at which the meter racked up the fare as we headed towards town. There is something rather disorientating about arriving in a strange place late at night. Thankfully my host who was away for the weekend had sent me a video showing how to find and get into the apartment. Otherwise I fear I would have spent the night under a tree in the rain. I was eager to check out my surroundings the following morning and have to say that I was blown away by the ‘city’ view from the decking outside. I had planned a town day to get some final supplies including gas, and to double-check that a bus would get me to Kautokeino the following afternoon. Research at home showed that there was no direct service on a Sunday (and none on a Saturday) and that the connection that I needed was exactly zero minutes long. Emails to the bus company had been ignored, so I set off on the walk into town rather anxious and keen to get some definite information. That anxiety was heightened further when I discovered the bus station was simply a weedy patch of gravel and the tourist information centre was closed for the weekend. There was an electronic board in the window showing the first bus I wanted, but no indication of the connecting service. It would be a case of turn up and see the following afternoon. 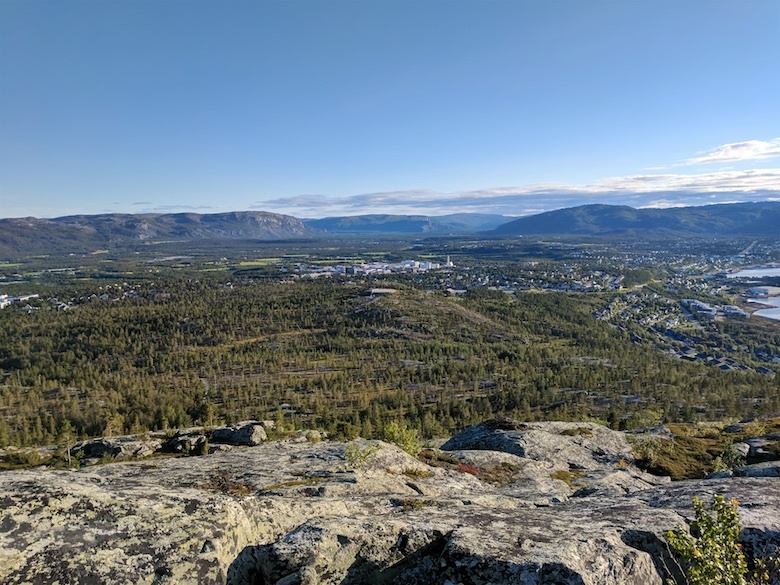 With gas and food for my stay in Alta procured I headed back to the apartment and made up some lunch for a short hike. My accommodation was located on the lower slopes of the 213 metre high Peak of Komsa. A myriad of paths lead to the rocky summit and a view that is out of proportion to its small stature. The next day I had a long time kicking my heels, with check out from the apartment at midday and the bus at 16.05. Alta is not a Sunday town and the main street was pretty apocalyptic in its complete absence of life. Most of Alta’s shops are in a single shopping centre which was closed. I suppose that when you are 236 miles north of the Arctic circle and the sun does not rise for two continuous months, indoors is attractive! I managed to waste a few hours by loitering on a bench and then going for a very expensive pizza,my bus anxiety growing. 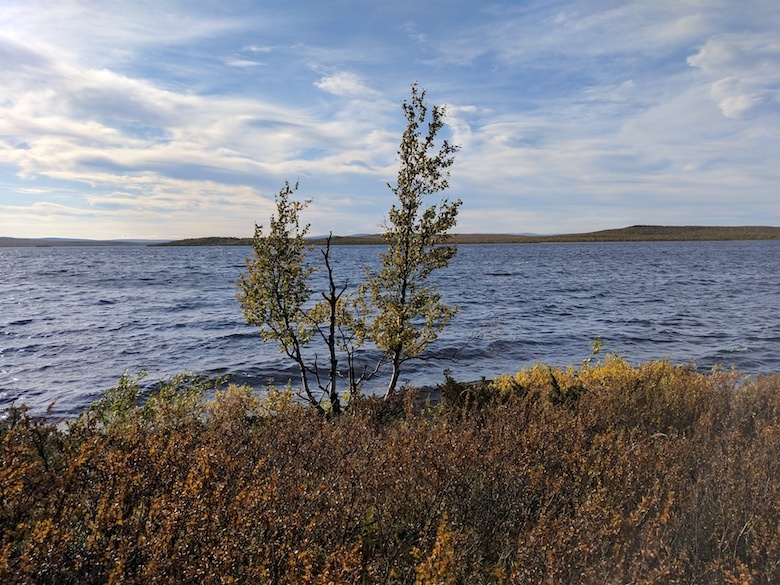 When the bus arrived I was pleased that I managed to pronounce Kautokeino correctly and relieved that the bus driver would be driving the connecting bus. The journey went smoothly and when we arrived at Gievdneguoika (just a bridge) there was already a bus waiting on a lonely road in the absolute middle of nowhere. 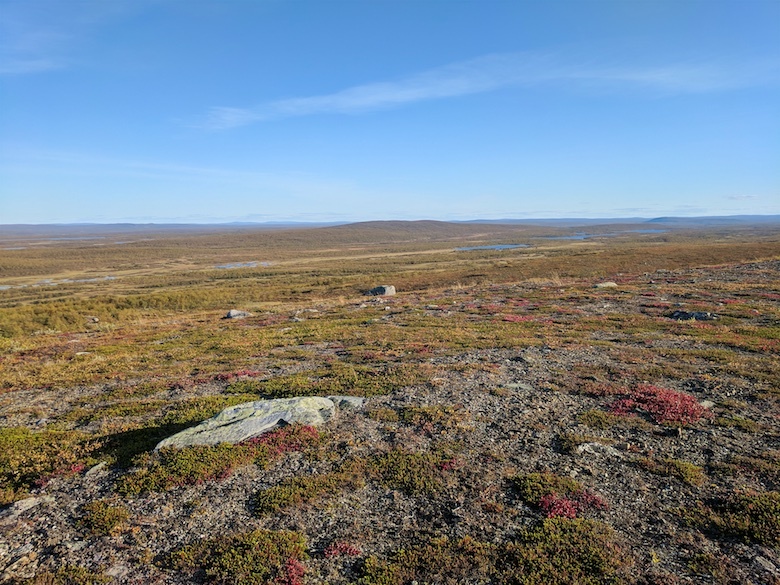 Passengers and luggage were swapped over and I finally relaxed on the final half hour into Kautokeino. Before setting off to find the start of the trail I popped into the garage / service station in town for a snickers and a can of coke. It set me back just over £6. I was glad that my wallet was going to stay in my rucksack for the next twelve days. That rucksack was heavy, weighing just over 20kg. 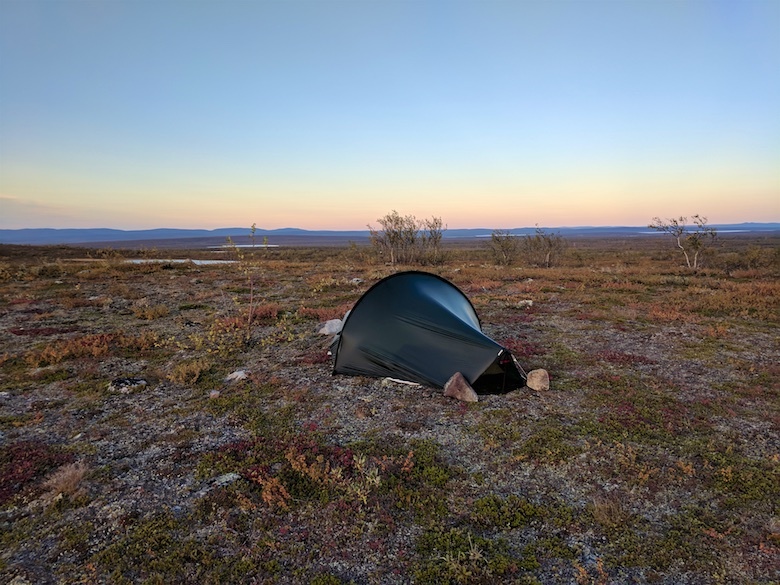 It contained everything that I would need for 12 days whilst crossing a large chunk of wild and remote terrain. 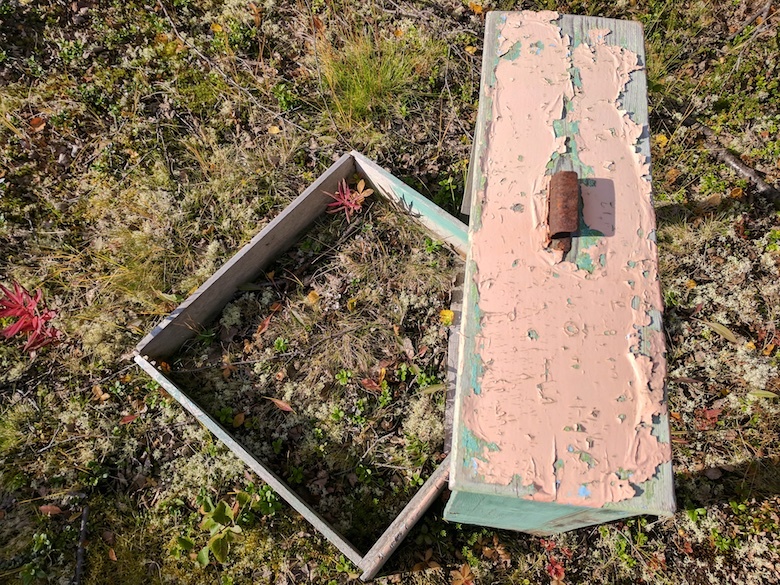 The actual trail starts a couple of kilometres out of town at a hand painted sign and a deteriorating information board. The information board appeared to suggest that I initially take a parallel route to the official one I had marked on my map. In retrospect I think that perhaps it meant don’t take the parallel route. I should have brushed up on my Norwegian. 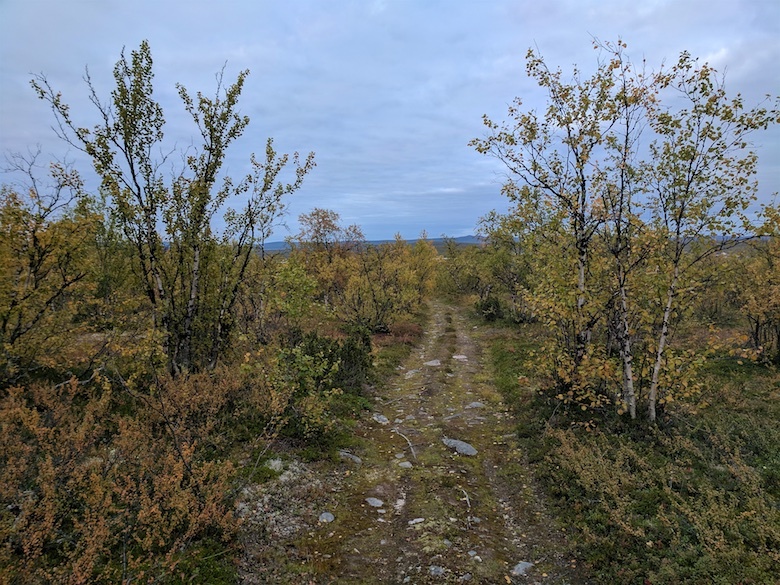 Anyway the parallel route started off as a nice soft track through the birch trees. I realised that I was not going to get as far as I initially planned that first day. I had got the sunset times wrong and it was going to be dark earlier than I thought. The light was already fading under the leaden sky. The trail passed between two lakes so I filled my water bottles, hood up to avoid the mosquitos that were keen on a meal. I then headed back along the trail a short distance to a flat patch of mossy ground that I had spotted. 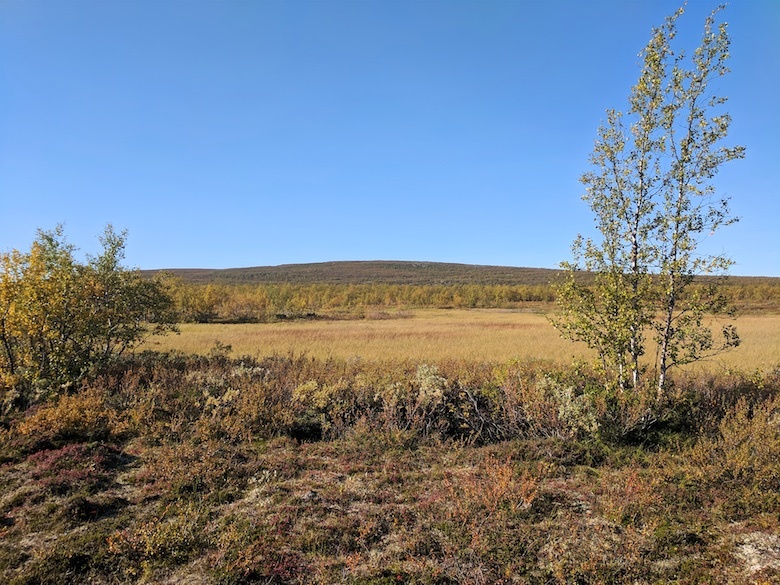 Suitable pitches can be difficult to find north of the Arctic Circle. 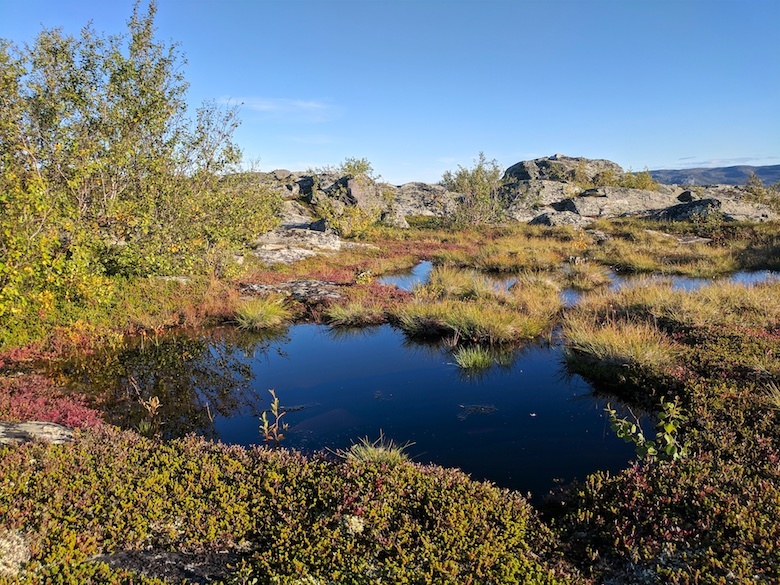 The ground is either rock, bog or tough prickly vegetation. You have to forget about the lush grassy pitches of the UK. It’s only when my tent is first pitched and my gear laid out that I start to relax on a long backpacking trip. When I realise that I have not forgotten anything and the stress of getting to the start of the trail is over. 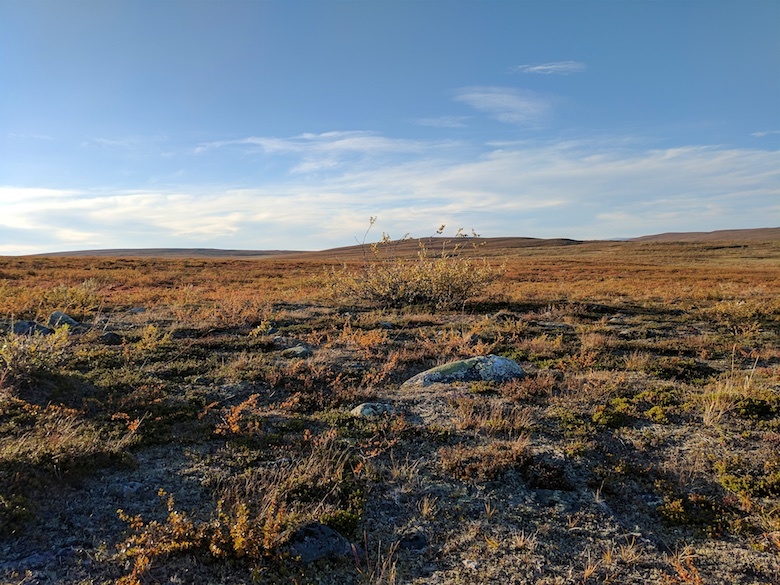 Although in early September the nights are quickly drawing in, dawn still comes early in the Arctic. I woke to clear blue skies and a chill in the air. 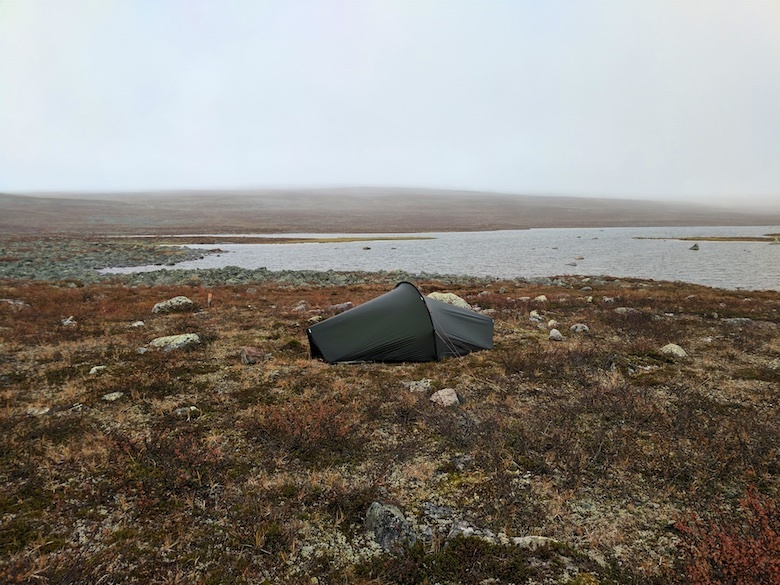 I sat and ate breakfast outside the tent, waiting for the condensation to dry before packing it away. 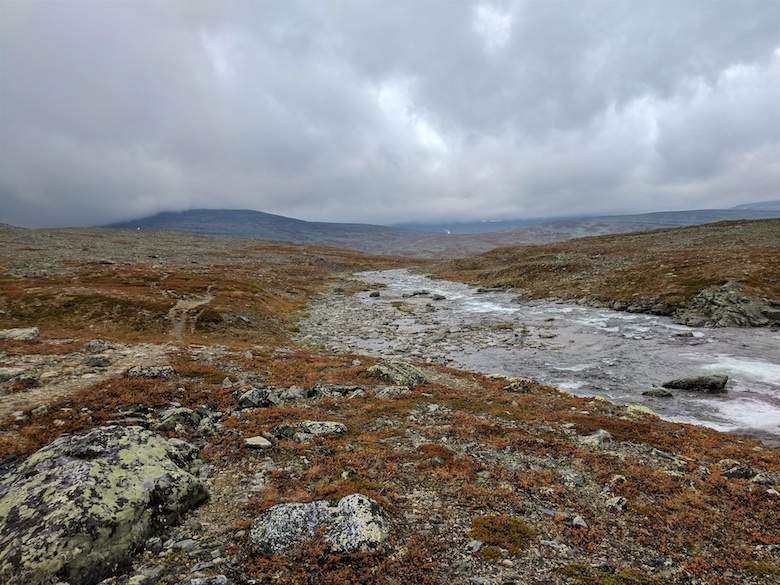 The track continued to give easy walking and the sound of traffic on the road into Kautokeino began to fade. At regular intervals I checked my position on both the map and on my GPS, pleased that this ‘alternative’ route was so straightforward. I began to hope that the whole route would be a nice stroll in the park. The track slowly started to fade and I realised that it had not connected with the official route as it should have done. Using my GPS I set off into a tangle of birch and undergrowth on a mission to get back on track. I found exactly where the trail should have been but there was no sign of it on the ground. 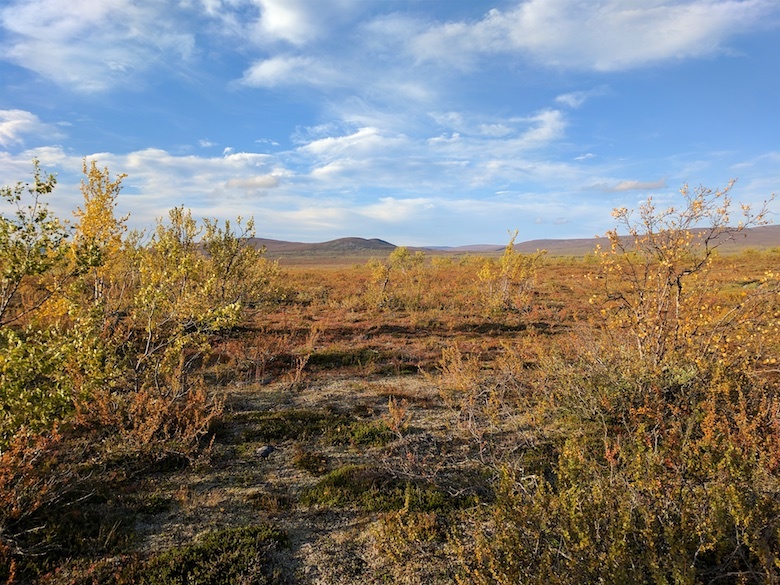 I navigated through dense vegetation on the line of the trail, cursing and wondering where it had gone. 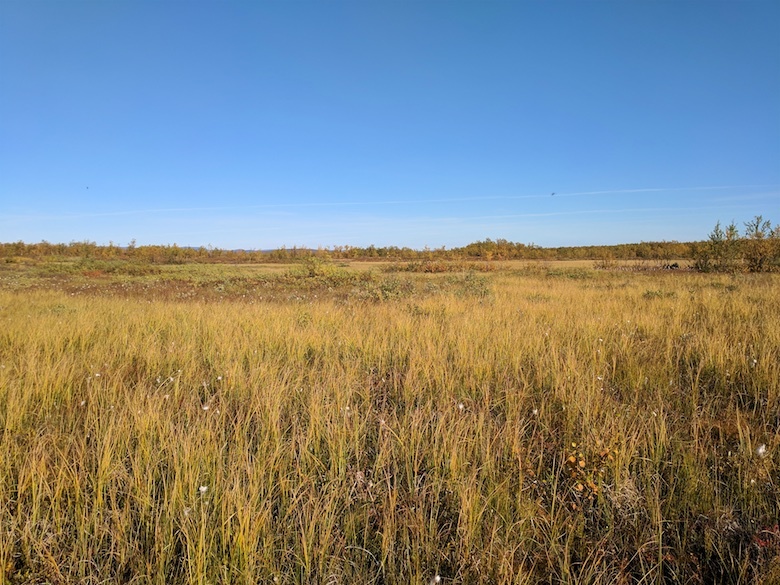 This continued for some time as I came to an open marshy section, the trail nowhere to be seen. I squelched my way across, occasionally backtracking to avoid particularly deep or wobbly sections. 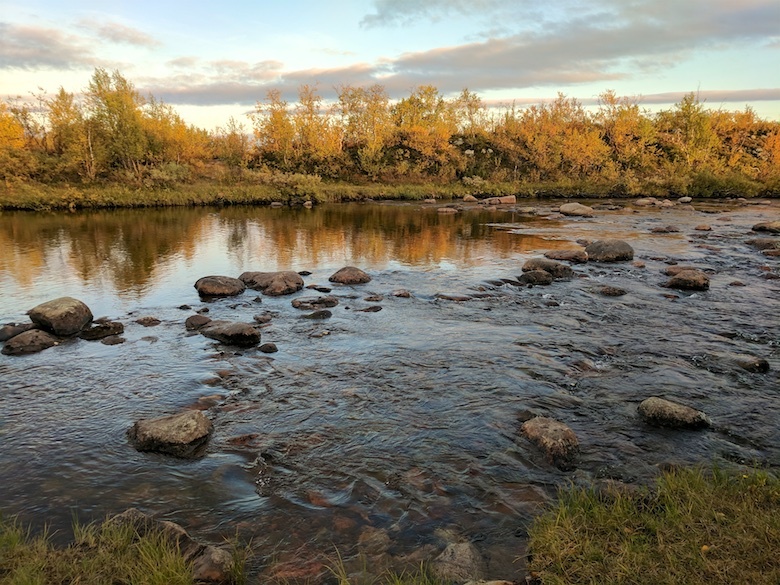 Slow moving streams would be particularly boggy and difficult to approach. I got to the other side of the shallow valley and was relieved to climb onto firmer, drier ground. Although this meant getting tangled in vegetation once again. With a heavy pack, surprisingly warm weather and biting insects I was already wondering if I’d bit off more than I could chew. And then suddenly I came across the narrowest of paths, red blazes of paint on the trees. 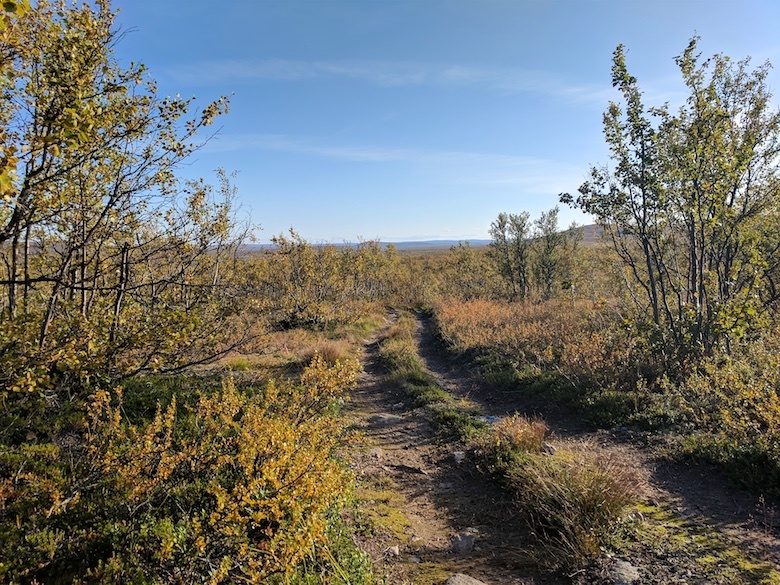 An intermittent trail to follow increased my confidence and quickened my pace. The rest of the day was spent frequently losing this trail as it wound its way through bog, marsh and forest. 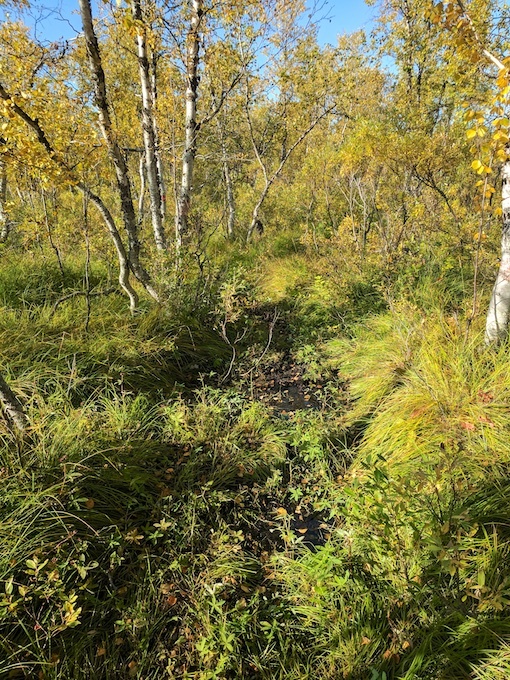 The worst section was a combination of marsh and forest, the trail being a knee deep ordeal of stinking black bog. One small stream was just a little too wide to jump across. It looked to be only a few inches deep so I walked across, sinking to my thighs in the swamp hidden beneath. I walked in wet undies for the rest of the day. The trail once again became a firm track as higher ground was reached and it wound its way towards the 528 metre summit of Goaskinvarri. 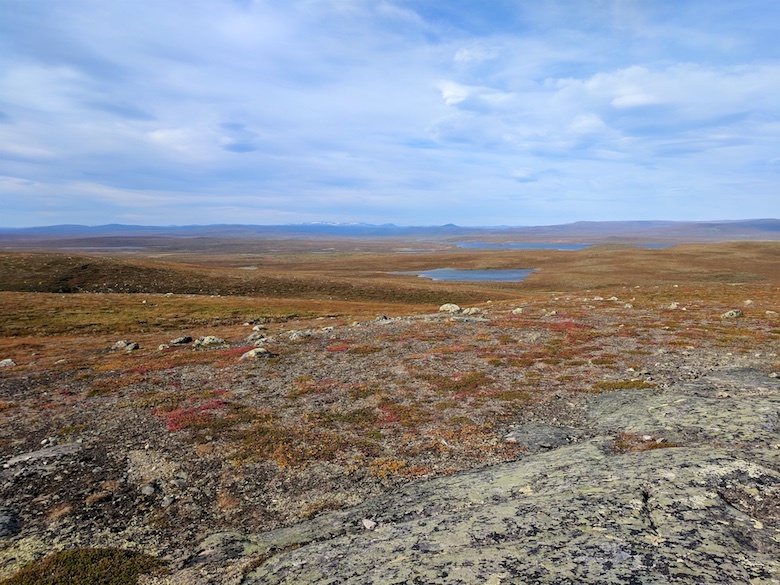 This small summit was the first time that I was able to appreciate the sheer scale of the landscape that I was in. In some ways the view was more impressive than an array of jagged peaks. There was literally nothing as far as the eye could see, just a vista of forest, lakes and low fell. I imagined what it would be like during a mid winter storm in such an open and exposed place. After another section of wet ground I decided to pitch early after spotting another soft and flat area of deep moss and lichen. It was beautiful being at the edge of the forest, the trees a golden yellow, open fells rising above a brightly coloured marsh. The insects were out but not too troublesome and they all dissapeared during the cool Arctic evening. I woke just after midnight and popped my head out of the tent to see my first ever show of the Northern lights. A wisp of green was pulsating overhead, coming and going like it was blowing in the wind. I wish that I had got up and set up the camera. Instead I took some snaps on my mobile and was soon asleep again. The trail had taken its toll. The following morning I got creative with the route. 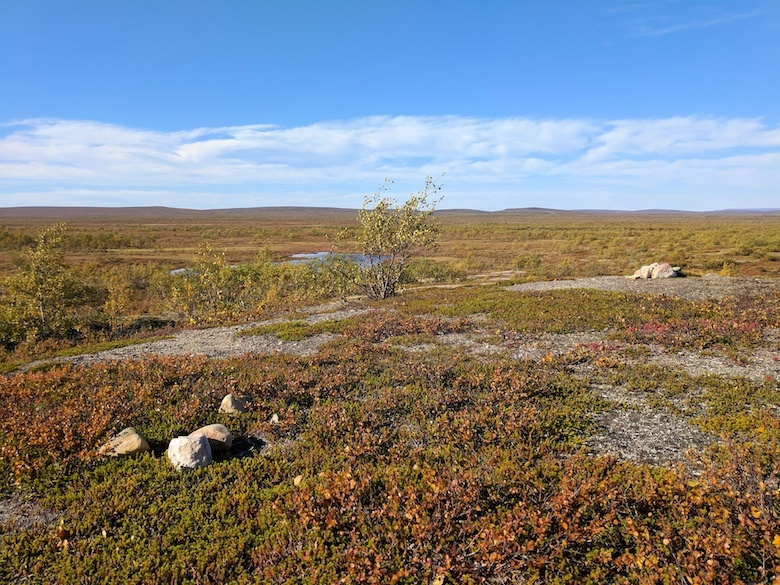 The Arctic Trail (Nordkalottruta) heads towards the road and then does a loop around the hamlet of Čunovuohppi and a hut with the fabulous name of Madam Bongos. I however had noticed an unmarked trail on the map that instead would take me over some low fells and rejoin the route. I was keen to get up high again rather than flounder through boggy forest. 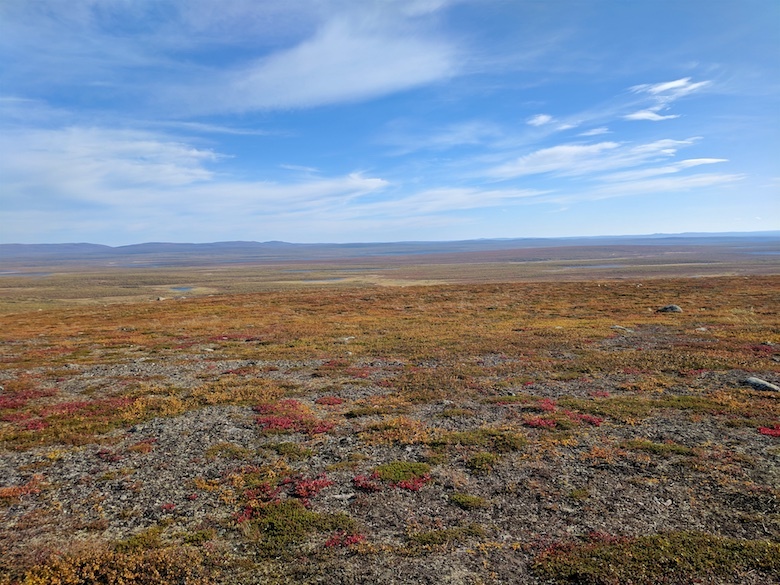 It turned out to be a good decision as a clear path led across a crisp landscape with fantastic views under the clearest blue skies imaginable. As I rejoined the trail (after spending an hour looking for it) I noticed what I had found strange over the past couple of days. The skies were completely empty, there were no planes or helicopters. Just the sound of the wind and my own footsteps. 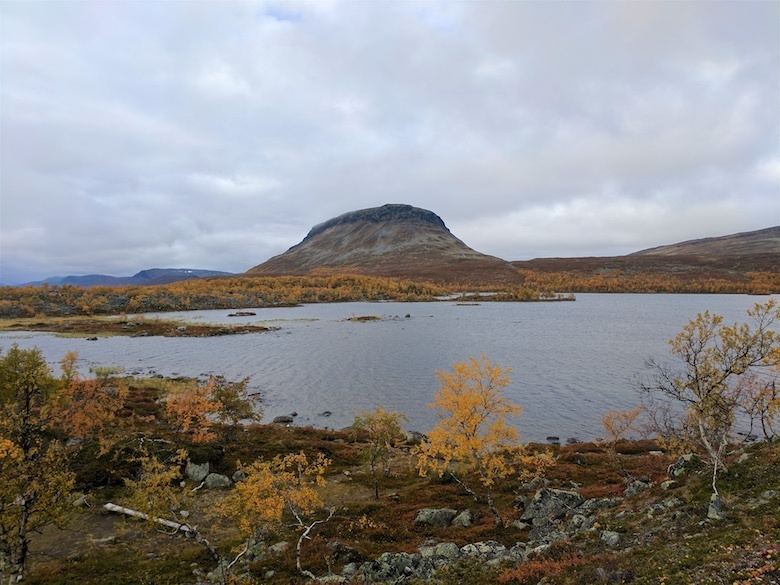 Later that day I found out that although devoid of hikers this area is the work place of the Sami people. I met four in total on huge quad bikes out checking their reindeer and the reindeer fences. They were all friendly, stopping to see what I was up to and where I was heading. One explained that one side of the fence was the winter grazing ground whilst the other was for summer. The reindeer would soon be swapping sides. The rest of the day was thankfully spent above the tree line, which this far north is 450 metres. 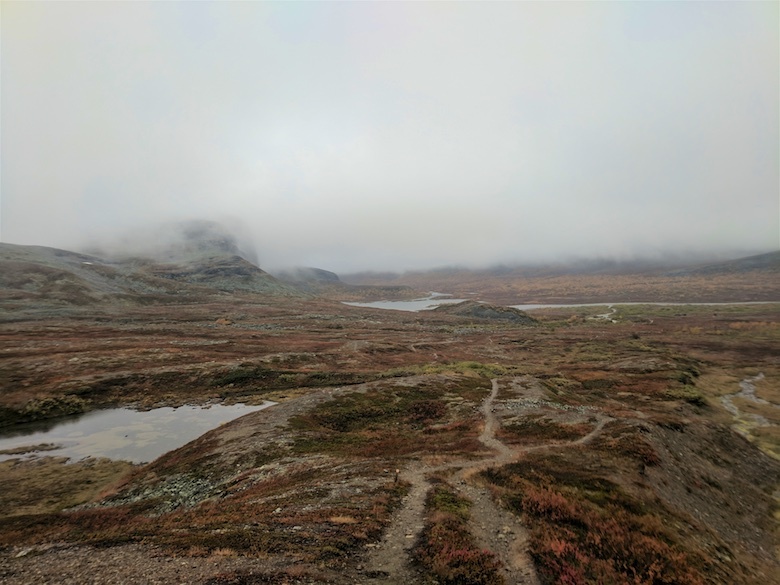 A series of quad bike tracks led easily across the hills and I passed an eerily quiet Sami settlement, a collection of small cabins and the ubiquitous rotting caravan. I pitched a bit higher that night, just above 500 metres. The wind was cold and strong and the tent pegs struggled to get a good purchase in the thin soil. Several large rocks had to be deployed to keep the tent attached to the ground. It was a great evening sitting snug in my tiny tent listening to the wind and watching the moon rise. The trail early the next day stayed high, leading to the 600 metre summit of Rivkkos. 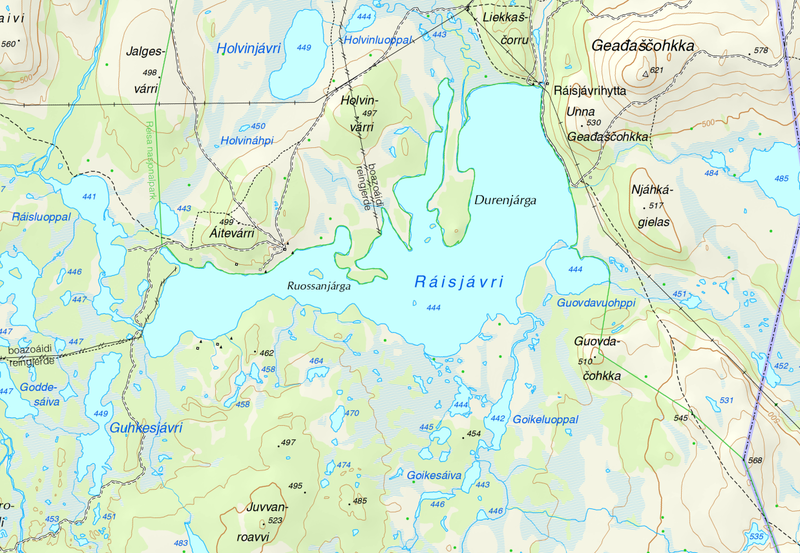 The first thing that drew my eye was the large Ráisjávri lake just within Reisa National Park. 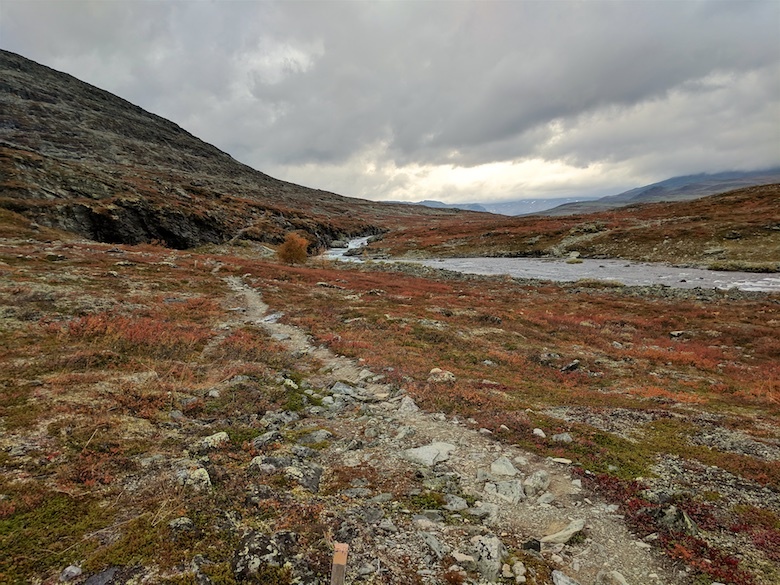 The Arctic trail (Nordkalottruta) would follow the shoreline before heading towards the gorge for which it is known. On the horizon I could see the snow capped peaks of Halti which I would cross the following week. The one manmade intrusion into this part of the trail is a powerline that cuts through the wilds in an unnaturally straight line. Thankfully it is a double wooden pole version rather than the steel monstrosities of home. Most of the time you can’t really see it but there are sections when the trail crosses it. Along the eastern shore of Ráisjávri it provides a good handrail, although this did not stop me losing the path yet again in a mire and tangle of undergrowth. 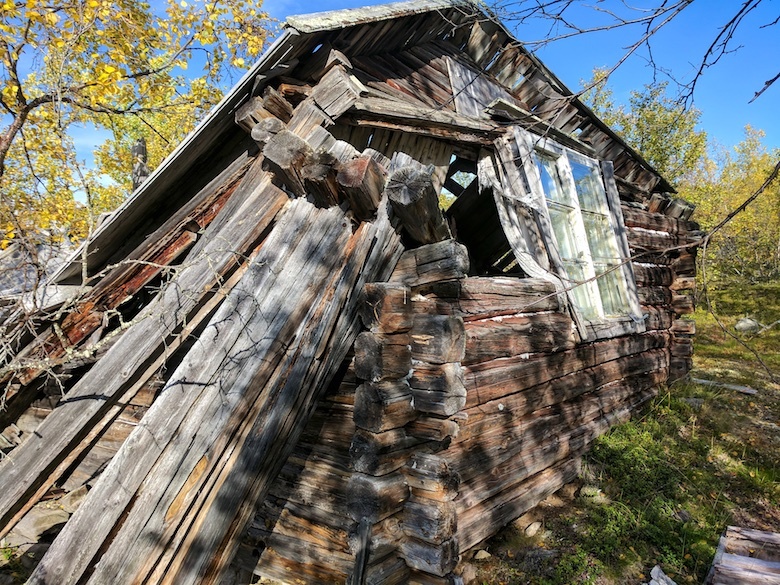 Losing the path meant that I did come across an atmospherically dilapidated hut in the forest. Complete with rotting furniture and curtains it was straight out of a horror movie. There are a few cabins around Ráisjávri but no one was at home, the only sign of life being a smokehouse giving off a wonderful smokey / fishy aroma. I would have happily have purchased an arctic char to go with dinner that night. 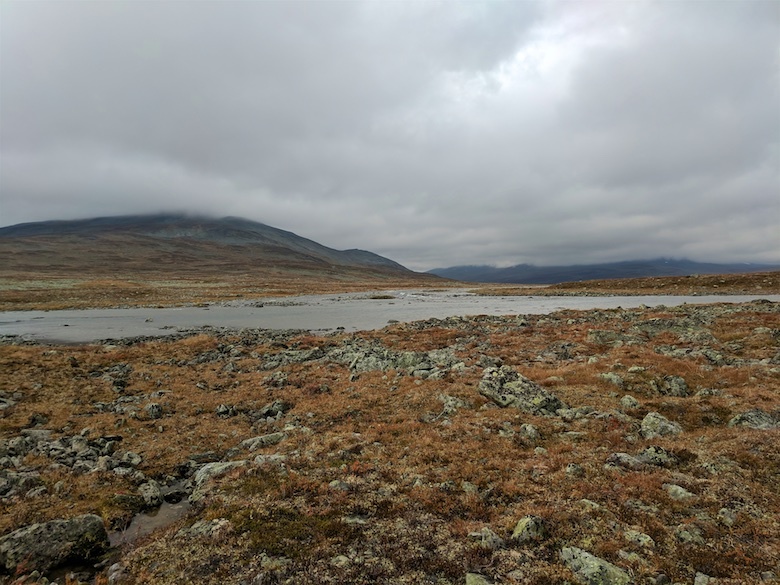 Shortly after passing the locked cabin at Ráisjávrihytta I crossed the boggiest bog that I have ever experienced. It wasn’t just boggy but bordering on dangerous. The whole area had been churned up by quad bikes so was a quaking, black oozing mess. Matting has been laid on top on some sections but there is nothing to secure it to. I wouldn’t be surprised if people haven’t sunk there without trace. At least there was a deep, wide and freezing cold river to cross before getting mucky again. 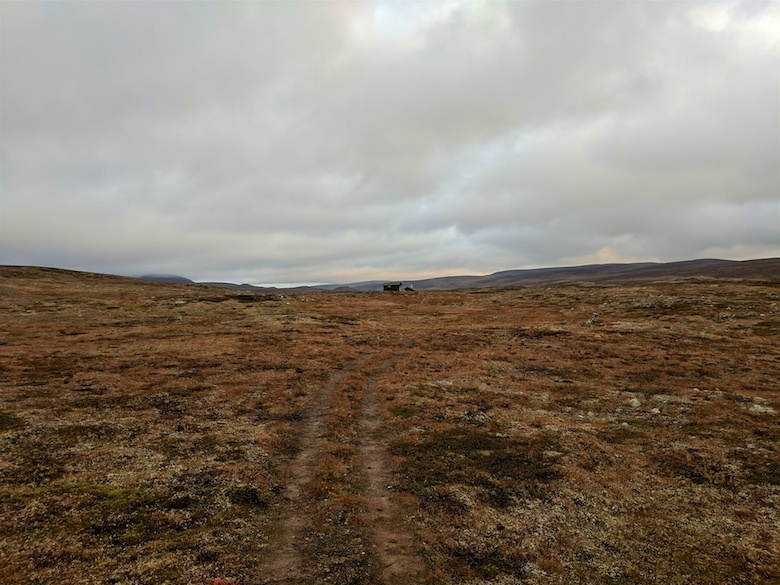 After the bogs of doom the ground became drier and a series of quad bike tracks over stony ground were followed. The end of Ráisjávri was passed and the scenery began to open up, hills rising to the north. 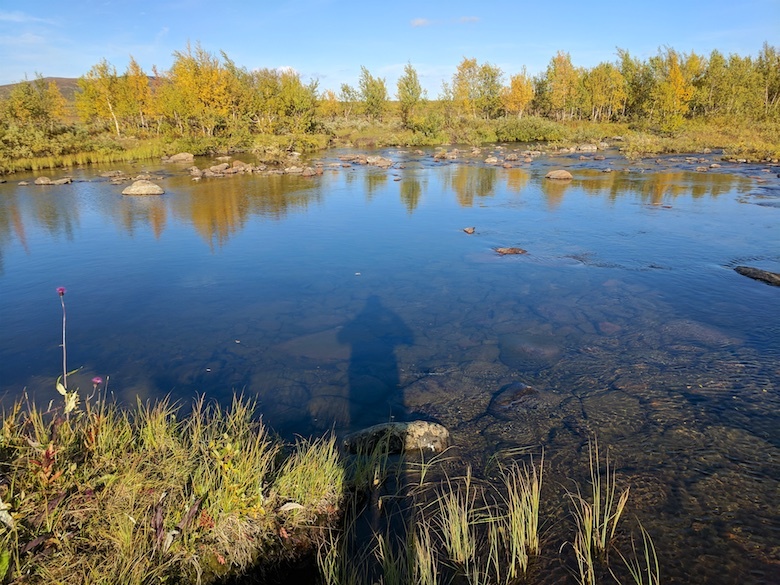 There was one more river to cross that day, the ritual of taking off boots and socks and putting on a pair of sandals. The water cold enough to make you gasp. I was never hard enough to go for a proper dip. I found a well used pitch close to the river, the surrounding trees even more yellow than ever. It was cold enough that night to freeze the platypus bottles solid along with anything else left in the open porch. 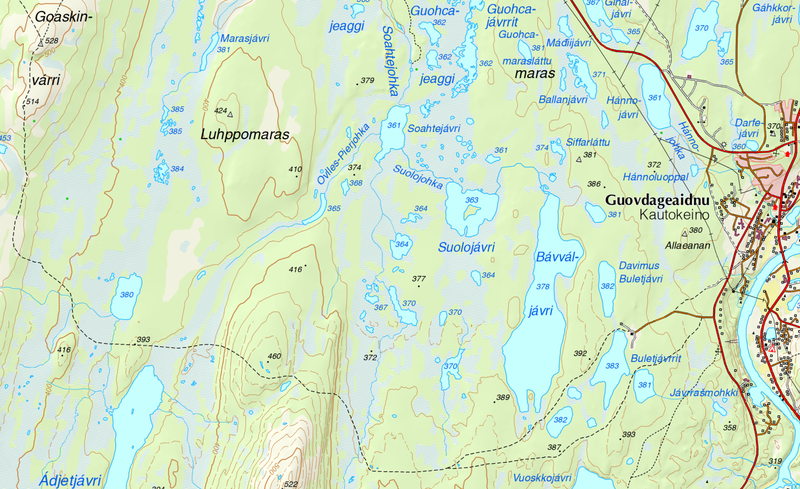 The paper map that I used on this segment is the red covered Norge-serien 10165 Guovdageaidnu. If you’re interested in following this route on an electronic topo map they are in order below. You can click to view them full size.